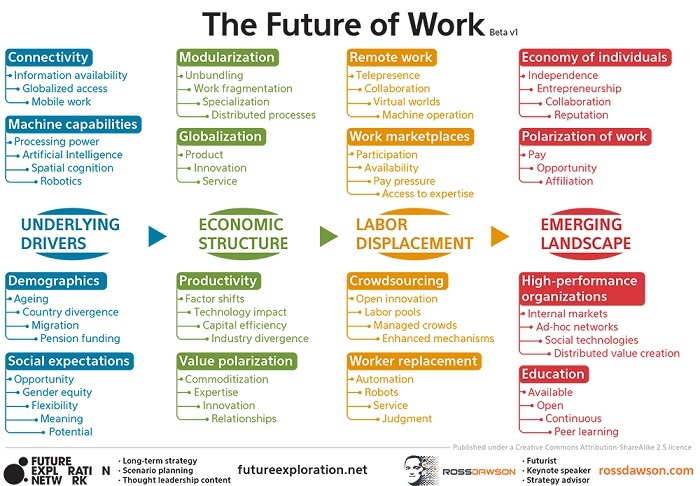 Last Labor Day I synthesized the Future of Work. This year I thought I would share some remarkable people who inform and inspire me as well as a couple of collaborations I have been involved with modeling curation & talent clusters. At one point people we considered experts by being the source of information. Being the point person to disseminate knowledge meant that you were capable and credible. That was when knowledge didn't aggregate as quickly as it does in this data era where data doubles not in decades, not in years, but in hours. In Cognitive Surplus Clay Shirky reminds us "the issue today is not information overload, it is filter failure." What this means is, there is so much information out there, you need a strong filter and you need strong people around you to filter out what is most relevant in a sea of relevance. So, one of the most important skills that must be acquired is the ability to curate; organize themes in a way that allows for understanding and swift decision making. You have often seen my posts with 10 significant links as I say many times "you will know me by my lists." That is because I cannot tell you what is relevant to your life. I can, however, tell you themes that you should be tracking to ensure you have your pulse on significant trends that may impact your future choices. Being a conduit vs. a source is a new frame for expertise in the data era. Peter Vander Auwera @petervan is co-founder of Innotribe, an innovation incubator within the epicenter of banking SWIFT. An element of his job is traveling around the world meeting interesting people who are transforming the world of work. He started a community called Corporate Rebels as he believe most change in a large organization is going to come from outliers and brave individuals imbedded in the existing business. He wants those individuals to feel less alone and have even more courage to help change systems from within. His most recent personal writing has been on the essence of work. This year I was involved in two very special collaborations. 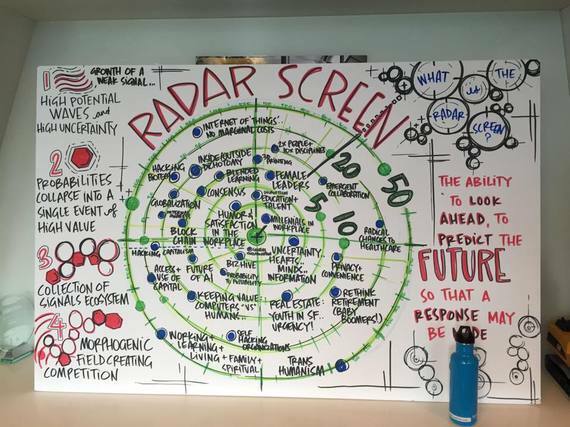 This spring I attended The Future of Work Summit held at Vodaphone Innovation Incubator in Redwood City, CA. There were approximately 145 participants who were professors, independent contractors, VCs, entrepreneurs and students. The group was organized by visionaries Tirza Hollenhorst & David Hodgson and facilitated by Ann Baddilo. It was the most productive learning event I have attended so far as the key intent was to scale our experience to enhance the lives of those in the new economy of co-working, talent clusters and freelance engagements. The rest of the day was spent in work-groups tackling these themes that we determined were the most important. Each issue had a facilitator. Each group created a work document synthesizing key learnings and suggestions. Strategy & Business Magazine - @stratandbiz is celebrating 20 years in publication this year. Part of their celebration is tell the story of the History of Management. Earlier this year a small group of people in organization development were invited to Price Waterhouse and Coopers in New York. The posed question was "what individual and themes most contributed to the history of management as we knowing it." Luckily they did not ask for "the meaning of life." 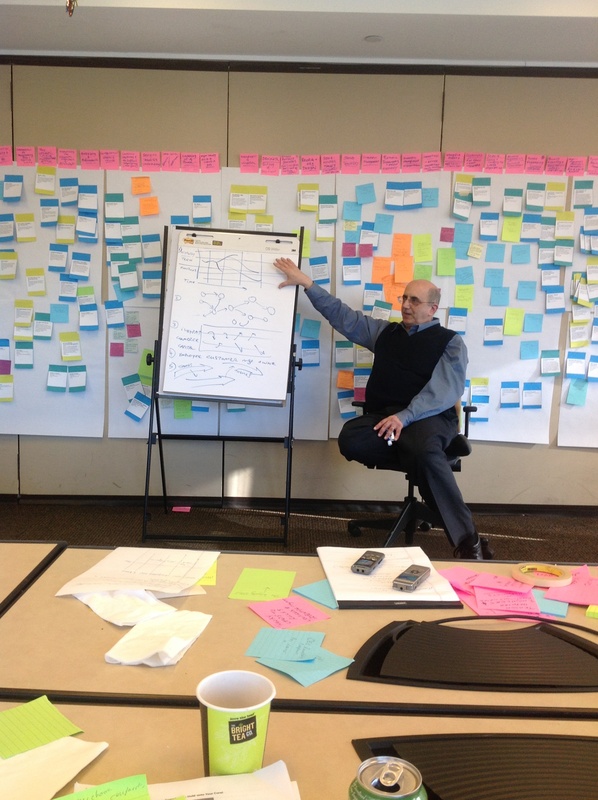 In a board room filled with over 400 sticky notes we were completely overwhelmed. There is "what" and there is "so what." With editor & chief Art Kleiner's gracious facilitation we decided that framing themes without specifically identifying key outcomes was a better, more interactive approach. This supports the macro transition from being a source to being a conduit. We mapped out themes and resources that have impacted our thinking across time using philosophy, history and sociology to be our guide. Instead of coming up with a timeline and key points we framed 20 significant themes and suggested the resources for those who want to do a deeper dive "20 Questions for Business Leaders." You will be invited to participate in more cross functional collaboration and seeing more white papers framing questions instead of espousing expertise. Tracking themes, identifying spotters, participating in collaboration with multi-disciplinary frameworks -- this is the the future of work and the future of working.